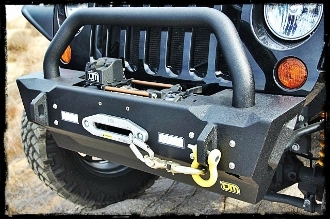 The TJM Jeep JK rock crawler stubby bumper has been designed to satisfy the high demands of the discerning Jeep JK Wrangler owner. Carefully crafted to suit the styling of the JK Wrangler while providing maximum protection and a host of features. a winch frame that takes an array of winches all standard on this attractive piece of metal. The best stubby bumper on the market.